The Fiji Basketball men’s side will be competing for the first time in the FIBA Asia men’s World Cup 2018 Pre Qualifiers Bangkok later this month. Kinton International Group came on board to sponsor the national team’s uniform at the tournament. 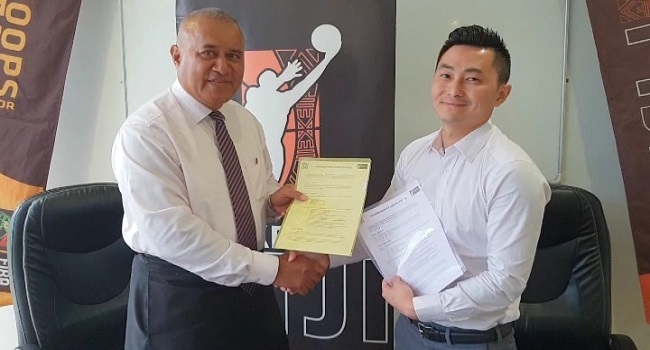 While receiving the sponsorship, Basketball Fiji President, Major General Ret’d Ioane Naivalurua says the assistance is a major boost for the side as they trying to qualify for the second round before securing a place in the 2021 World Cup. Meanwhile, the 12-man squad secured a place in the qualifying round after winning the silver medal at the 2015 South Pacific Games in Papua New Guinea. Eight teams will compete in the qualifier. The Pre Qualifier runs through the 24th of November to the 4th of December.